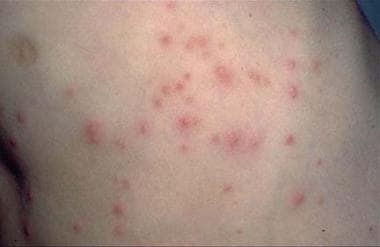 Gram-negative folliculitis, first described by Fulton et al in 1968,  is an infection caused by gram-negative organisms. The infection may occur as a complication in patients with acne vulgaris and rosacea and usually develops in patients who have received systemic antibiotics for prolonged periods. Gram-negative folliculitis should be considered in patients with acne who have a flare-up of pustular or cystic lesions and in patients whose acne is resistant to treatment. Gram-negative folliculitis may also occur in the setting of hot-tub immersion and in people infected with HIV. Note the image below. Pseudomonas folliculitis. Courtesy of Hon Pak, MD. The anterior nares serve as a reservoir of gram-negative organisms. Prolonged systemic antibiotic treatment can alter the relative prevalence of bacterial flora carried in the nasal passages. An inverse relationship has been demonstrated between the presence of gram-positive organisms and gram-negative organisms in the pharyngeal, axillary, and toe-web flora. In patients with acne who are treated with oral antibiotics, the number of Staphylococcus aureus organisms and diphtheroids decreases and the number of coagulase-negative staphylococcal and enterobacterial organisms increases in the nose. Usually, gram-negative bacteria constitute less than 1% of the total bacterial flora in the nose. In patients with gram-negative folliculitis, enterobacteria constitute approximately 4% of the total bacterial flora. The antibiotic-induced increase in gram-negative organisms usually does not result in adverse effects, and once antibiotic treatment is discontinued, the nasal flora reverts to its previous state. However, in a small number of patients, the increased number of gram-negative organisms results in a transfer of organisms to neighboring areas of the face. The bacteria populate existing acne lesions and can also cause pustules to arise de novo. In addition to the need for suppression of interspecies interference, gram-negative organisms require a sufficiently moist environment to survive and proliferate. The presence of excessive seborrhea may promote the survival of gram-negative bacteria by trapping moisture in the face. The effectiveness of isotretinoin in the treatment of gram-negative folliculitis has been attributed to its ability to make the skin and the mucous membranes dry as a result of the marked reduction in sebaceous gland secretion. Another factor has been implicated in the pathogenesis of gram-negative folliculitis. An assessment of hypersensitivity reactions to various microbial recall antigens and granulocyte functions was performed. Lowered serum concentrations of immunoglobulin M (IgM) and alpha1-antitrypsin and elevated levels of immunoglobulin E (IgE) were found, suggesting that altered immunologic factors may play a critical role in the pathogenesis of gram-negative folliculitis. Systemic antibiotics, such as tetracyclines, can alter the nasal flora. The resultant overgrowth of gram-negative bacteria can lead to folliculitis. Type 2 lesions are associated with Proteus species. These species are motile and, thus, have the ability to invade more deeply, producing the large suppurative abscesses that result in deeper cystic lesions. Gram-negative folliculitis is a relatively uncommon complication of prolonged antibiotic therapy. In two studies, approximately 4% of patients with acne vulgaris who were under treatment with broad-spectrum antibiotics reported this infection. However, the frequency of this infection is probably generally underestimated because clinicians rarely perform correct sampling and bacteriology. No racial predilection is documented for gram-negative folliculitis. No sexual predilection is documented for gram-negative folliculitis. Although gram-negative folliculitis is largely a complication of acne vulgaris and thus is expected to follow the age distribution of that entity, a slightly increased age at onset has been observed. The tendency for gram-negative folliculitis to begin after the early teenage years is most likely because most patients who develop gram-negative folliculitis have undergone treatment of acne with a broad-spectrum antibacterial agent for a prolonged period. Gram-negative folliculitis has no associated increase in mortality. Morbidity is related to local pain and to the unwanted cosmetic effect of the folliculitis. Complete remission of the gram-negative folliculitis results with isotretinoin use. If antibiotic therapy is used, long-term suppression is required. Educate patients that gram-negative folliculitis is a different disease entity and that the treatment of the primary disease (acne or rosacea) is causing the gram-negative folliculitis. If antibiotic therapy is used, make patients aware that treatment is usually only suppressive. Fulton JE Jr, McGinley K, Leyden J, Marples R. Gram-negative folliculitis in acne vulgaris. Arch Dermatol. 1968 Oct. 98(4):349-53. [Medline]. Leyden JJ, Marples RR, Mills OH Jr, Kligman AM. Gram-negative folliculitis--a complication of antibiotic therapy in acne vulgaris. Br J Dermatol. 1973 Jun. 88(6):533-8. [Medline]. Chastain MA. A cycle: recurrent gram-negative folliculitis with Citrobacter diversus (koseri) following eradication of recurrent staphylococcal pyoderma. Arch Dermatol. 2000 Jun. 136(6):803. [Medline]. Mostafa WZ. Citrobacter freundii in gram-negative folliculitis. J Am Acad Dermatol. 1989 Mar. 20(3):504-5. [Medline]. Mulholland A, Yong-Gee S. A possible new cause of spa bath folliculitis: Aeromonas hydrophila. Australas J Dermatol. 2008 Feb. 49(1):39-41. [Medline]. Julia Manresa M, Vicente Villa A, Gene Giralt A, Gonzalez-Ensenat MA. Aeromonas hydrophila folliculitis associated with an inflatable swimming pool: mimicking Pseudomonas aeruginosa infection. Pediatr Dermatol. 2009 Sep-Oct. 26(5):601-3. [Medline]. Bachmeyer C, Landgraf N, Cordier F, Lemaitre P, Blum L. Acinetobacter baumanii folliculitis in a patient with AIDS. Clin Exp Dermatol. 2005 May. 30(3):256-8. [Medline]. Resneck JS Jr, Abrouk M, Steuer M, Tam A, Yen A, Lee I, et al. Choice, Transparency, Coordination, and Quality Among Direct-to-Consumer Telemedicine Websites and Apps Treating Skin Disease. JAMA Dermatol. 2016 Jul 1. 152 (7):768-75. [Medline]. Palit A, Inamadar AC. Current concepts in the management of bacterial skin infections in children. Indian J Dermatol Venereol Leprol. 2010 Sep-Oct. 76(5):476-88. [Medline]. Böni R, Nehrhoff B. Treatment of gram-negative folliculitis in patients with acne. Am J Clin Dermatol. 2003. 4(4):273-6. [Medline]. James WD, Leyden JJ. Treatment of gram-negative folliculitis with isotretinoin: positive clinical and microbiologic response. J Am Acad Dermatol. 1985 Feb. 12(2 Pt 1):319-24. [Medline]. Plewig G, Nikolowski J, Wolff HH. Action of isotretinoin in acne rosacea and gram-negative folliculitis. J Am Acad Dermatol. 1982 Apr. 6(4 Pt 2 Suppl):766-85. [Medline]. Tarlow MM, Piela Z, Schwartz RA. Gram-negative folliculitis - a diagnostic challenge. Dermatologia Kliniczna. 2002. 4:7-9. Disclosure: Received consulting fee from Galderma for consulting; Received consulting fee from Valeant for consulting; Received consulting fee from Promius for consulting; Received consulting fee from Anacor for consulting; Received grant/research funds from Stiefel for investigator; Received grant/research funds from Astellas for investigator; Received grant/research funds from Ranbaxy for other; Received consulting fee from Ranbaxy for consulting.